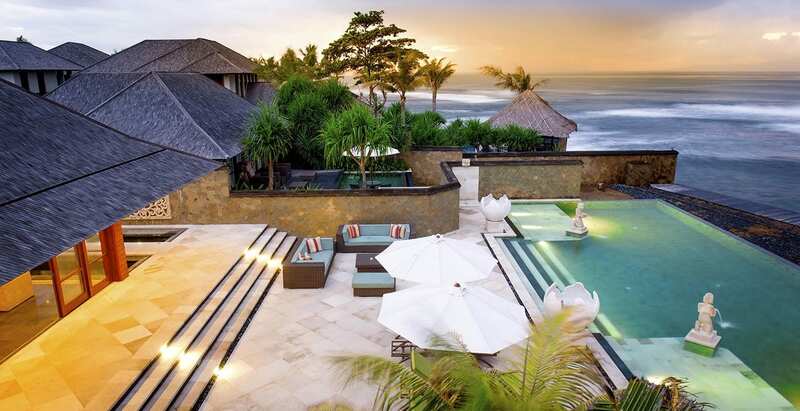 The name Puri Nirwana means ‘Heavenly Temple’, which is a pretty apt moniker for this sprawling mansion situated next to the sea in the small fishing village of Cucukan. 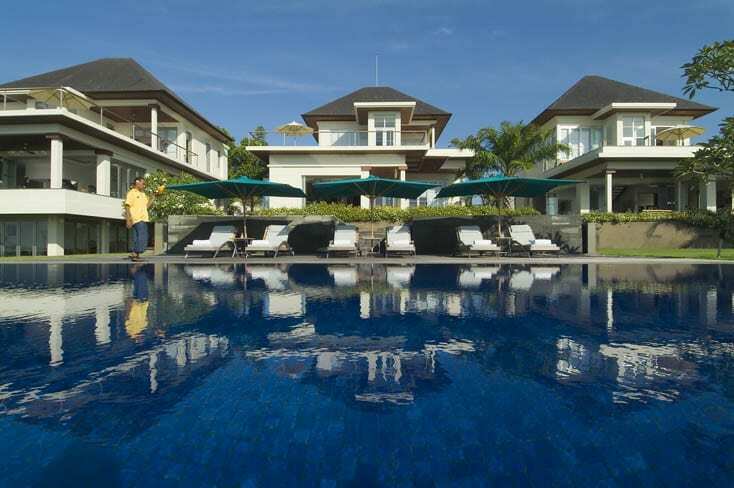 With 6 luxury bedrooms, 3 living rooms, a kid’s playground, games room, massive private pool and expansive manicured lawns, this is the perfect base for families, groups of friends, retreats and corporate getaways. Plus, the convenient location on the beach between Sanur and Candidasa and across the road from the Bali Safari & Marine Park means that you have a slew of fun activities just outside your door. 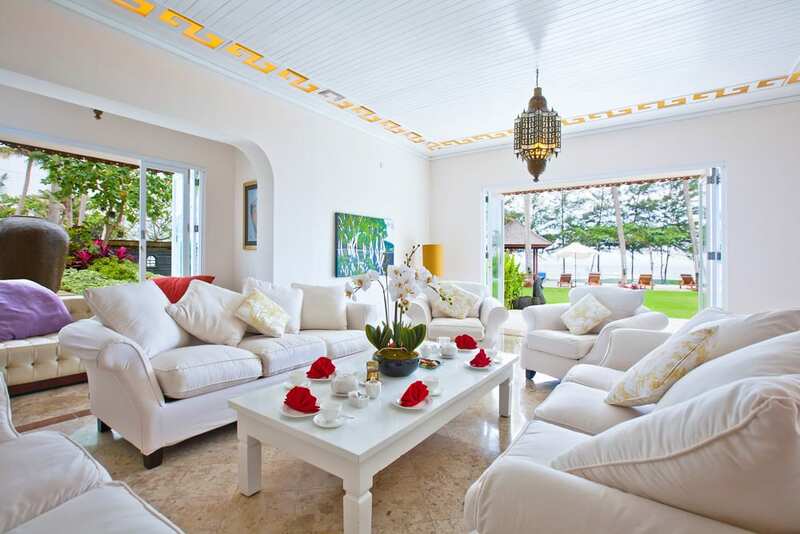 Villa Puri Nirwana is a marvel of plantation-style colonial architecture with a gorgeous white facade, sweeping verandahs and wooden shutters. The main building is surrounded by tropical gardens, emerald green lawns, and water features including fish ponds and a reflections pool, and it is fronted by a 16 x 5-metre swimming pool overlooking the ocean. 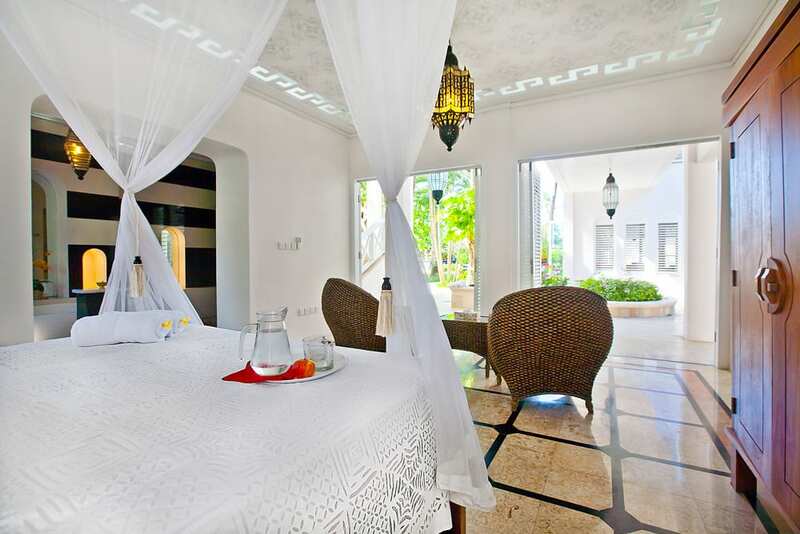 In addition, there is a separate spa pavilion in the gardens, as well as direct access to the beach and the Indian Ocean. 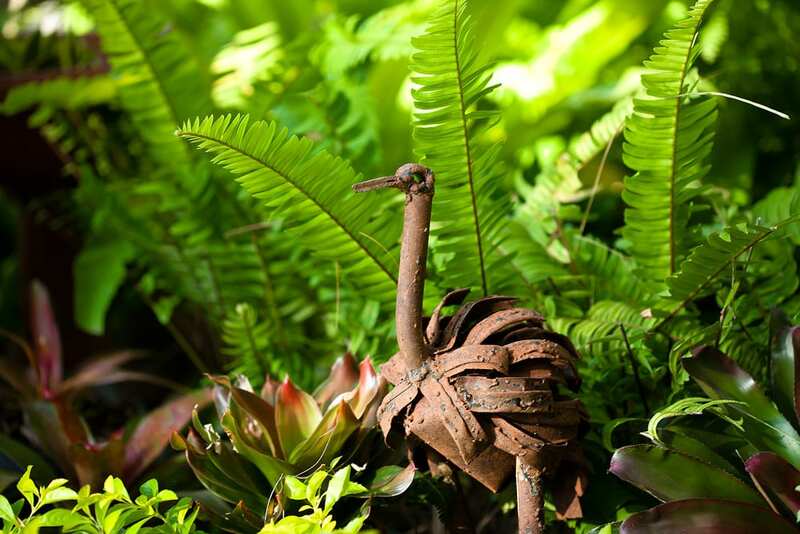 Throughout the villa, you will find colourful artworks from the owner’s personal collection, Asian-inspired furnishings, glass lanterns, and modern amenities like air-conditioning, state-of-the-art entertainment systems, luxurious toiletries and free Wi-Fi. 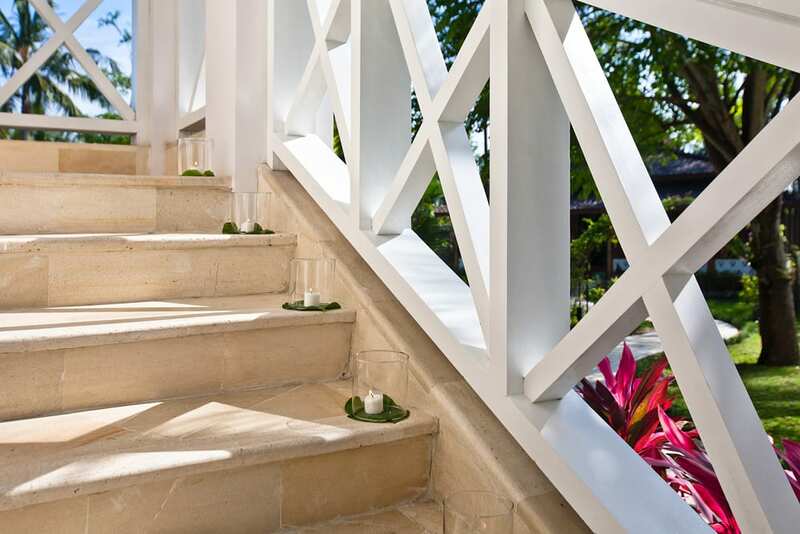 No detail has been spared here, from the large doors that open to allow sea breezes to come in to the marble floors, oversized stone bathtubs and even the wide entrance ways and the elevator for wheelchair and disabled access. 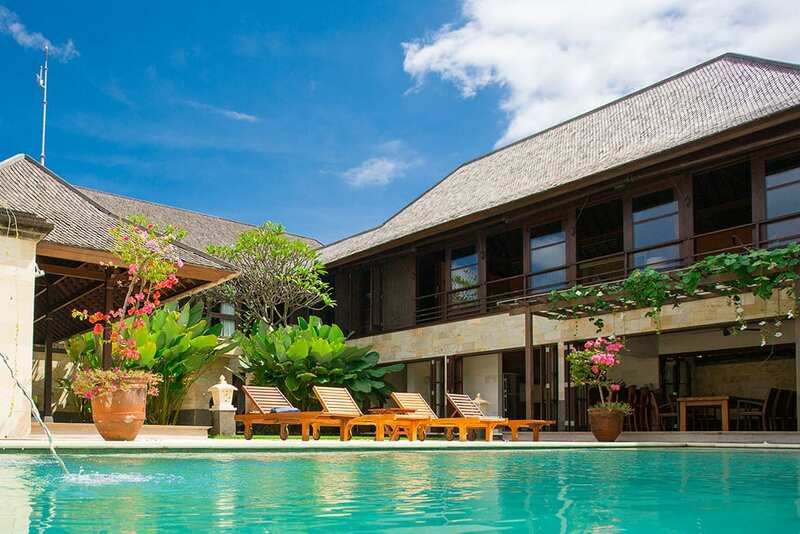 As for communal living areas, Puri Nirwana rings in with 2 TV lounges, 3 living rooms, 2 dining areas both indoors and outdoors, a fully equipped kitchen, entertainment room with a billiards table, huge garden, sand pit, pool deck, swimming pool and wading pool, spa, plus the long strip of black volcanic sand fronting the villa. This makes it easy to gather with friends and family for meals, conversations and games, or find a quiet spot to reflect. 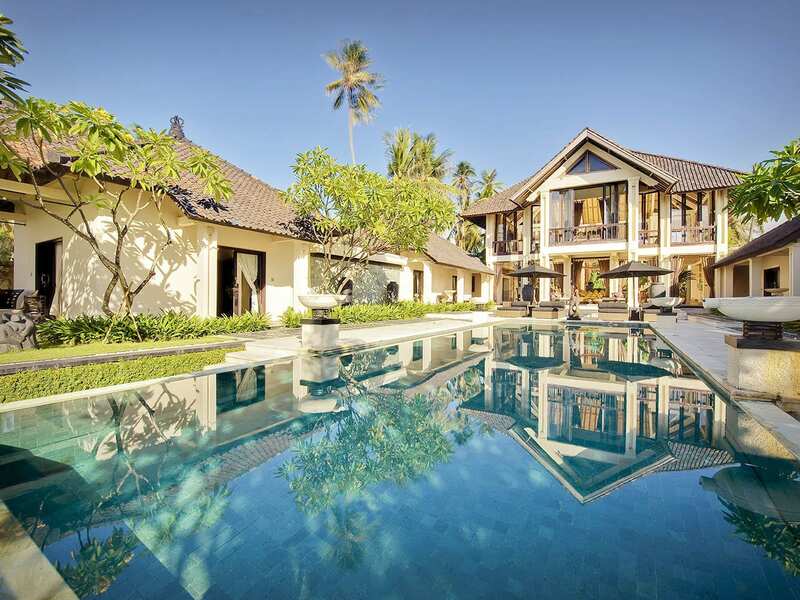 The Master Bedroom at Villa Puri Nirwana is palatial in itself, and it overlooks the grounds, pool and the ocean. On a clear day, you can see all the way to Nusa Penida in the distance. Located on the ground floor, this room has a plush king-sized bed, a ceiling draped in Balinese fabrics, white wicker furniture, and folding glass doors that open to the garden. There is also an enormous ensuite bathroom with a large black and white bathtub, walk-in rain shower and a special spa area with a massage bed. Just as spacious and stylish as the Master Bedroom is the Ocean Suite housed in its own annex on the second floor of the villa. This suite can be reached via stairs or the elevator, and it is home to a king-sized bed, writing desk, sofa and a bathroom with a rain shower. 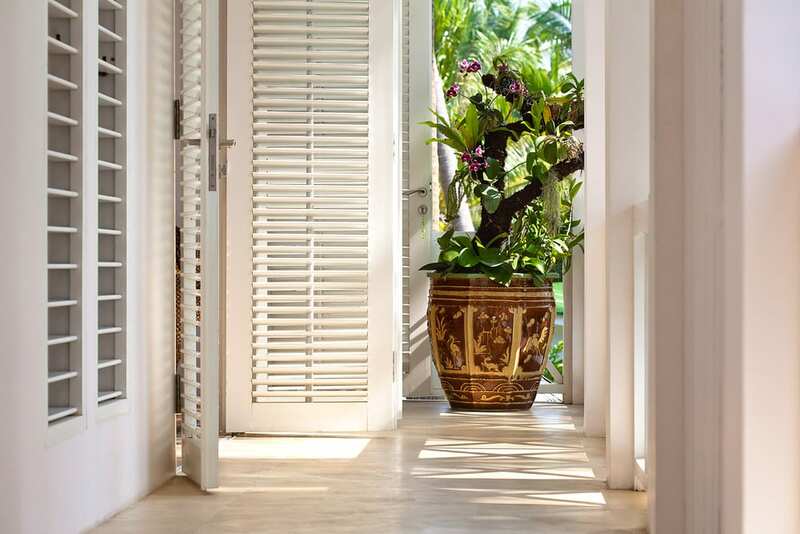 White wooden shutters invite cool breezes in, and an open living area makes for the perfect spots for sunset cocktails on the circular lounge or leisurely lunches or dinners. The four Garden Suites are perfect for little ones or visiting guests, and each looks out onto the gardens awash in flowers and trees. Two guest bedrooms are on the ground floor, while the other two are upstairs, and each features a king-sized bed, verandah, and black and white tiled bathrooms with marble floors and walk-in showers. CAPACITY 14 Adults, 8 Children. LIVING AREAS 2 TV lounges, 3 living rooms, 2 dining areas both indoors and outdoors, a fully equipped kitchen, entertainment room with a billiards table, spa, large garden, sand pit, pool deck, swimming pool, wading pool and Jacuzzi. POOL 16 x 5 m with jacuzzi. STAFF Full staff: villa manager and villa supervisor, villa attendants and housekeepers, team of gardeners, 24/7 security service, dedicated professional chef. COMMUNICATION Complimentary unlimited WiFi internet access, mobile phone coverage. ENTERTAINMENT Entertainment room with large screen TV is equipped with cable and satellite channels, DVD and play station. 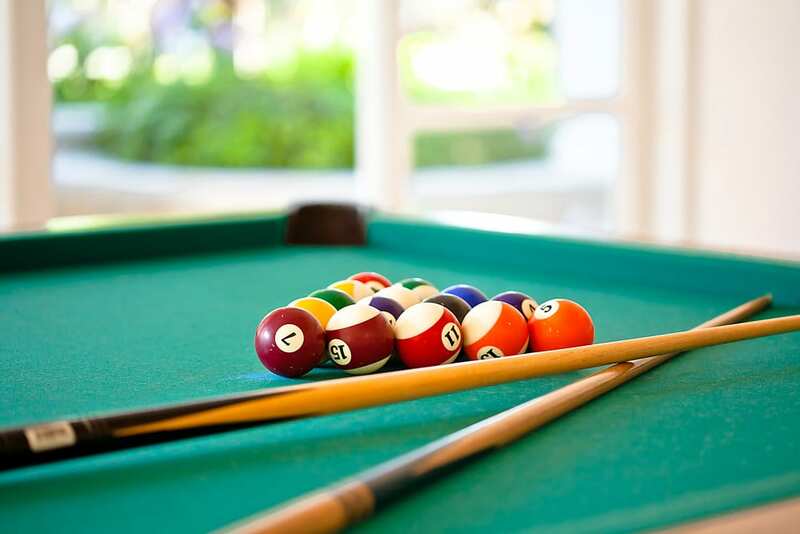 A billiard table and a table tennis table, library, a play area in the garden for children. FOR FAMILIES Play area and sand pit in garden. Baby cot and high chair. Babysitters on request. 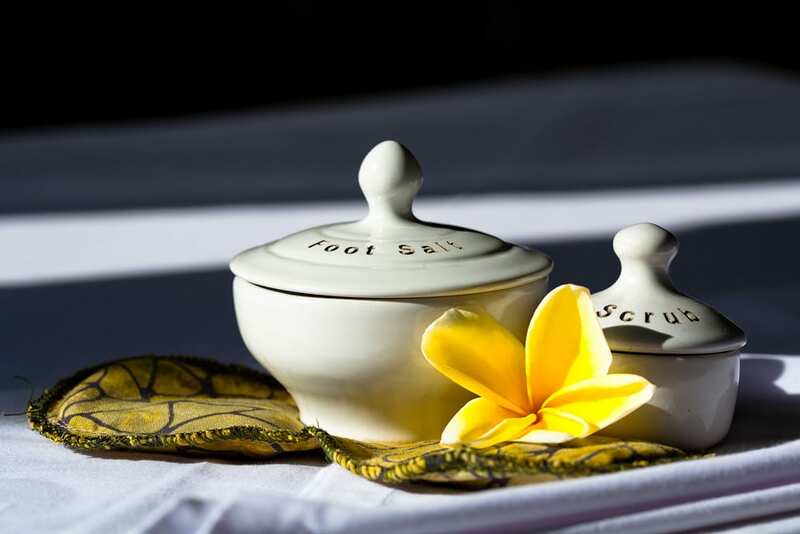 SPA A private spa housed in an atmospheric antique joglo set amongst tropical gardens, is the ultimate indulgence. A wide range of treatments can be carried out by professionally trained spa therapists (additional cost applies). EVENTS This stunning and spacious Bali villa sits right above the beach and provides large, well-manicured grounds with wonderful views of the ocean, making it the perfect venue for events of all sizes, and its extensive entertaining indoor and outdoor entertainment areas are sure to create the most memorable of occasions. All events or parties with more than 20 participants should be approved in advance by the villa management. ADDITIONAL Barbecue, back-up generator, safe deposit boxes. PROPERTY AREA 5,000 sqm (land), 1,200 sqm (villa). The location of Puri Nirwana is another unique aspect. 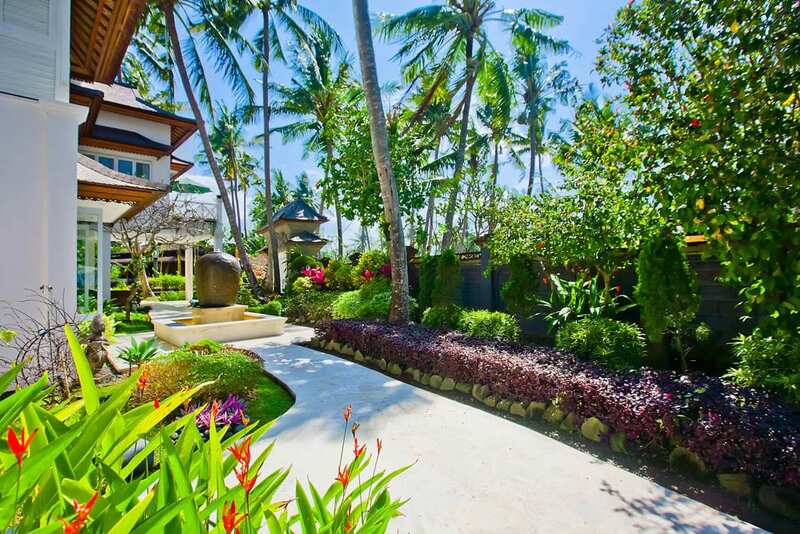 The only luxury villa in the small traditional village, guests are welcome to stroll through the village, attend local ceremonies and enjoy Balinese life. The nearby Keramis surf break is one of Bali's favourite "secret" surf spots offering surfers a welcome respite from the crowded waves of Kuta, Canggu and Uluwatu. 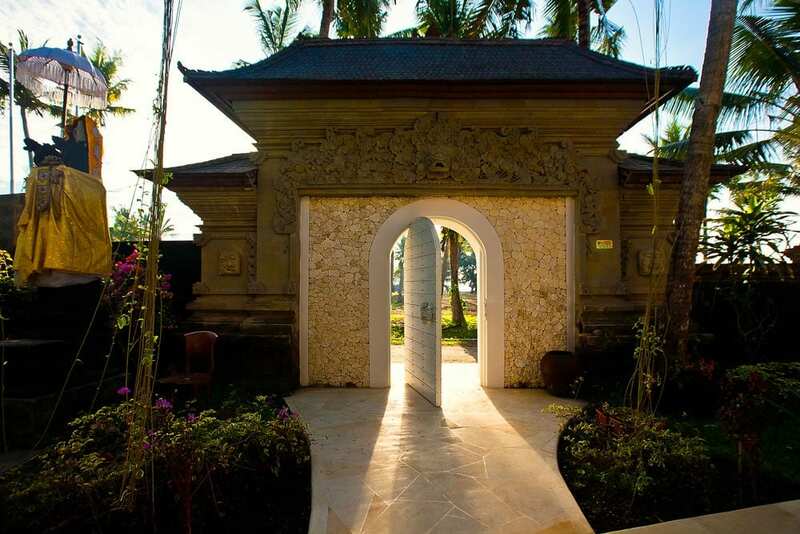 Located between Sanur and Candi Dasa means that those areas are easily accessible without fighting traffic and crowds and Ubud is a short drive away.